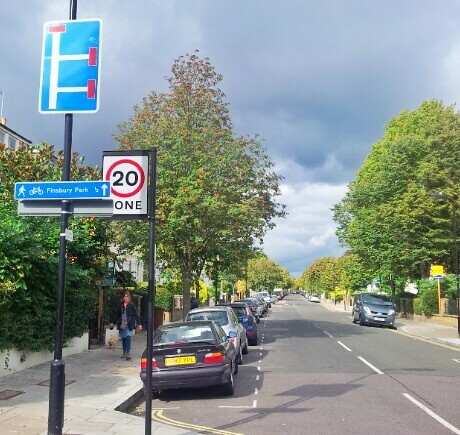 Hackney, London: the worst place for driving? After reading in the Evening Standard that more people cycle than drive to work in Hackney we went for a drive there to see why people hardly use cars in that inner London Borough. We knew we were off to a bad start when the only map we could find marked all the bike shops in that Borough. It got much worse very quickly. We started our drive at 10am from the North Western point of Hackney near Finsbury Park. Planning to head South we turned off the A503 to get to Stoke Newington. We were thwarted by a road block (which annoyingly allowed bicyclists through). We made a u-turn back to the A503 and traveled the long way round. 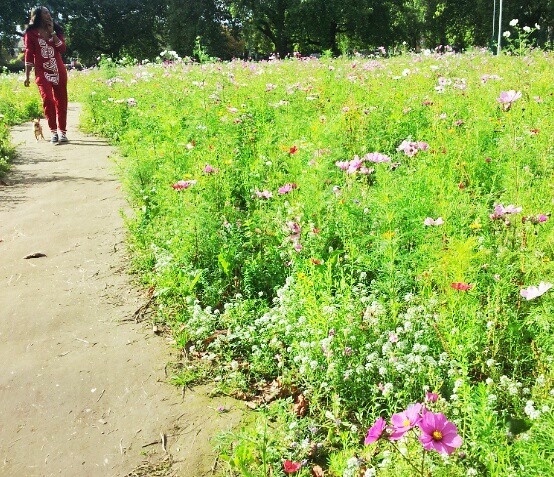 We drove along the A105 (Green Lanes) and attempted to head back into Hackney. Not only was there no through route for drivers just access for the local residents of those streets and bicyclists, the speed limit was only 20mph. We began to notice that there was hardly anyone driving at all. Lots of space for cycling and walking. 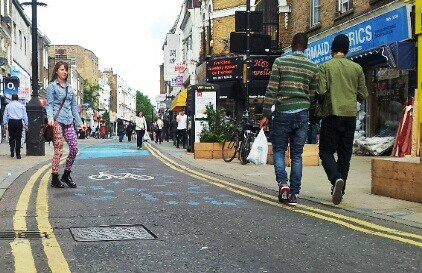 We decided to head to the A10, the Kingsland High road. Surely there we will get back to the normal driving nirvana that is usual in British towns. We turned onto Stoke Newington Church Street (B104) to more disappointment, there were people on foot on bikes and on the bus but hardly anyone driving a car! Turning left off the B104 we drove down a narrow road with road humps moving at about 8mph and to our extreme annoyance we came across another of those road blocks, a short cut for bicyclers. And to add insult to injury there was a group of school pupils and some teachers riding through the road block laughing (at us it seemed). They weren’t even wearing helmets! We headed to the A10 planning to drive through little road we know of old, John Campbell Road. Past the Rio Cinema leading to the A10. We couldn’t drive through. It was a space for people of all ages standing chatting, people parking bikes, even people cycling through encouraged by a dropped kerb, but no space for cars. After another U-turn we reached the A10. It was a nightmare. 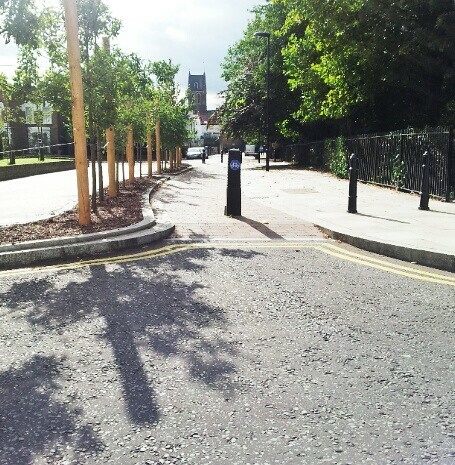 Almost no one driving, the pedestrian guard rails replaced by cycle racks. People walking riding shopping or just hanging-out chatting in the quiet street. We missed the reassuring buzz of car engines and the slight sulfurous scent of exhaust fumes. 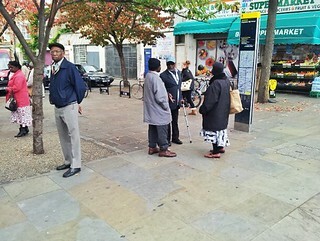 It was especially galling to encounter the Hackney equivalent of the lovable white van man. The cargo-bike man (and woman as we later discovered). 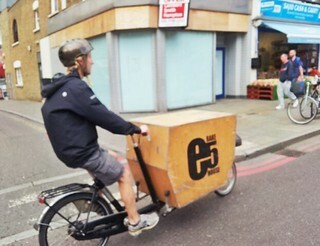 The local baker delivers bread across Hackney on a cargo bike! 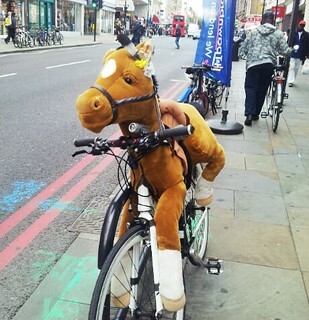 (We saw him 3 times that morning and later a woman delivering her 3 children from school in a similar bike). Wishing to escape to normality we headed to Mare Street planning a cheeky short cut through Ashwin Street to the A104 at Dalston Junction. And guess what … another blocked road (for cars) with people sitting drinking coffee, sneering and laughing as we u-turned again. Totally humiliating especially as the cyclers swanned past. At last Mare Street. It was a ‘mare’ To the North, the Narrow Way, once a mecca of engine noise, buses fumes, cars and their drivers with occasional pedestrian or bicyclists squeezing by had become a place for walking. And what of Mare Street itself, the heart of Hackney, the Town Hall and municiple centre at midday bathed in Autumn sunlight. 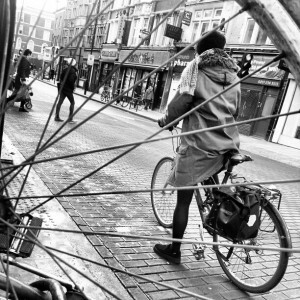 Would we find some respite, a little traffic, some va va vroom, a break from this people friendly slowed down Borough where there is more space for cycling and walking than for driving? 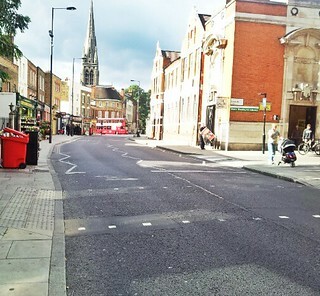 Mare Street had been narrowed, tamed, the pedestrian railings removed, the speed limit lowered, the pavement widened. Street life and cafe culture springing up where once we drivers had been king. It was all so depressing. There was something in the air in Hackney quite distasteful to old petrol-heads like us. So fellow drivers take our advice and steer clear of the London Borough of Hackney if you are looking for some clear space for driving. This entry was posted in Uncategorized on October 9, 2013 by David. This is outrageous news, what the hell do I pay all that car tax for? We need to organise a CAR-itical Mass protest event at the earlist opportunity. I shall be writing to my MP and petitioning the Queen. Something must be done to protect our long established rights to pollute and congest and bring noise and danger to all parts of our fair city. other outrageous examples of sacrificing the needs of personal hermetically-sealed mobile living-rooms to those with a life-expectancy generally a decade more than their infernal combustion engine-adherents include the closure to motors of Dunston Street by the Regent’s Canal under the Overground bridge, the closure to motors of Geffrye Street by Hoxton station for a street cafe and restaurant, and the planting of a tree a bench and cafe tables in the middle of Hackney Wick’s Prince Edward Road! Is there no limit?